UV sterilization is a great way to treat the water that comes into your home or business on Vancouver Island. Over the past 15 years Holman Plumbing and Water Treatment have used many different types of UV sterilizers. We have found the Trojan UV Max has greatly improved its design and simplicity for the average homeowner to service it. Also, bulb replacements are effortless compared to some of the other models. UV Max also has digital readouts up to 365 days with a reverse countdown as a reminder for bulb replacements. It will also put out an alarm 2 weeks before bulb replacement is required and Trojan has taken one more step – when a new UV sterilizer is installed, they will send to you by mail 10 months from the date of installation as a reminder that it’s time to change the bulb. Most homeowners usually forget to change the bulbs and the unit becomes useless. Holman Plumbing and Water Treatment always puts all of our customers on a maintenance notification plan, so that you'll know when it's time to change your bulb and filters to ensure optimal functioning of your equipment. We make sure our customers are well taken-care of. 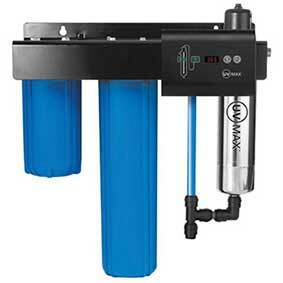 For more information about the many water treatment services we offer, visit our water filtration and treatment page. It's important to have clean water in your home, so give us a call today!